will i ever get used to the british weather...? 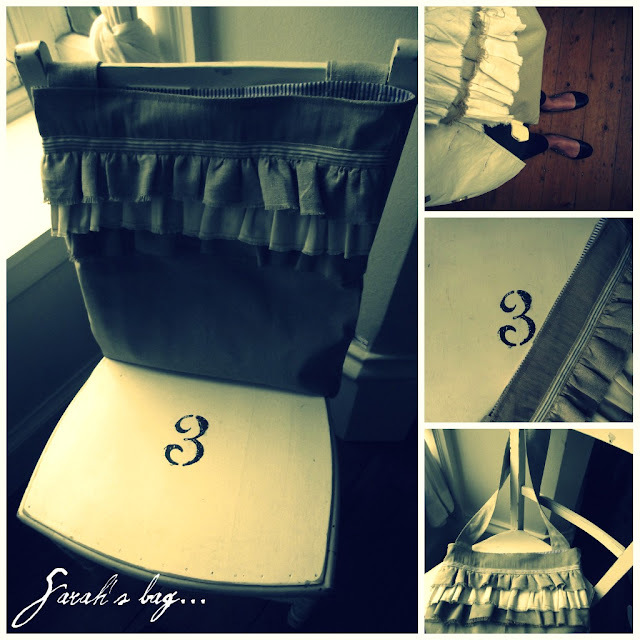 sarah won my ruffly-giveaway...she is a doll & inspires me constantly on her gorgeous blog *Modern Country Style*...oh the houses she takes us through...-get over there! i'm gonna show you when i get in my winter boots...i'm still holding out...just...! see my little *i love mum* note up there on my machine...? *murphy's law*- lunchtime- chance of rain...school pickup- lashing down...! there's some little projects i'm wanting to share..so ladies, get your glue guns loaded...! you are so talented. that bag is divine. hope you have some sunshine this weekend! Oh Melissa, you lovely lovely!! Thank you soooo much for this gorgeous post! The bag pictures have left me squirming with joy! I can't wait to get it!! It looks completely awesome - and so completely up my street! It's the kind of wow-statement that I shall have hours of fun planning whole outfits around!! Oooh she's a lucky lady! 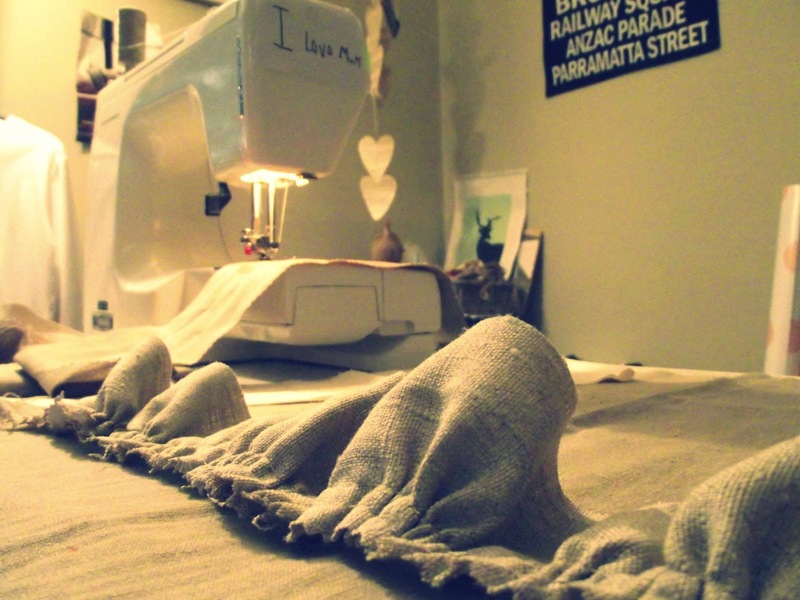 The linen fabric you use is just divine. I can't wait to see how you make your ruffly wreath, I would very much like to make one of those for Christmas. I do love me a pretty new wreath. Hope the rain has stopped now. We have had it all jolly week and now the sun is trying to shine. Might just be a nice weekend, hope yours is too. 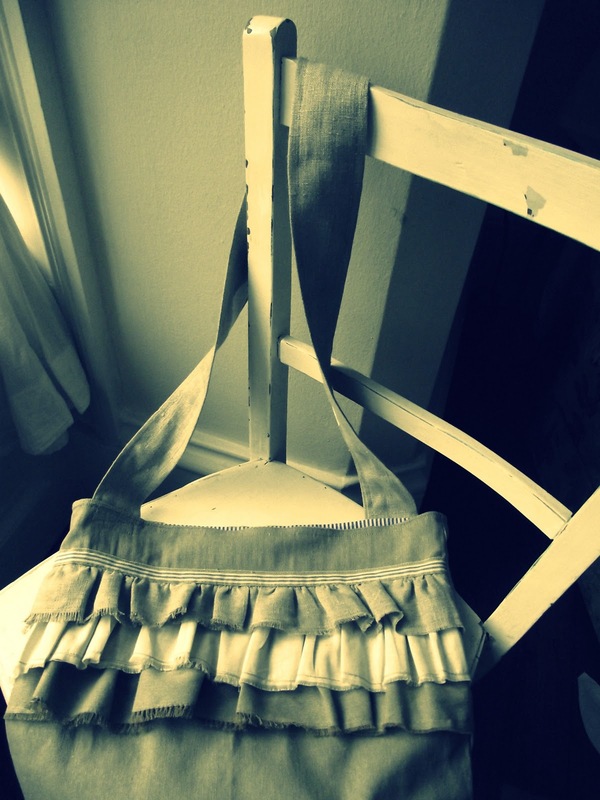 Such a cute bag...and I love all the fabric! Lovely pictures of course. Glad you enjoy sewing in the rain! Oooh, love the ruffles, and your cushion! As much as it is getting cooler there, it is warming up so fast!Today it will be 30deg cel here in the blue mountains! 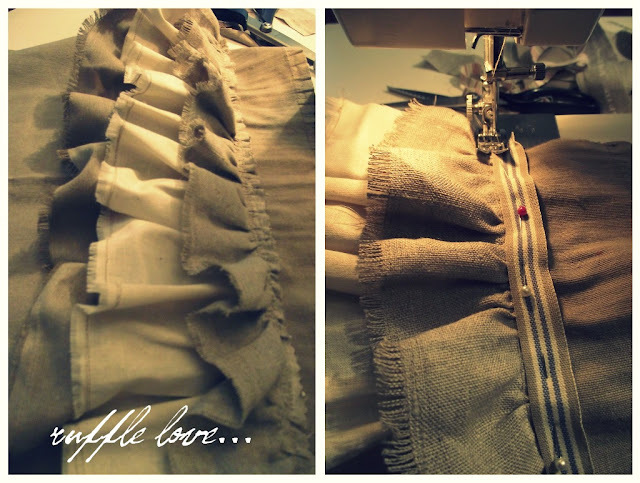 the linen ruffles with the striped ribbon are so beautiful, loved seeing the making of your lovely bag! 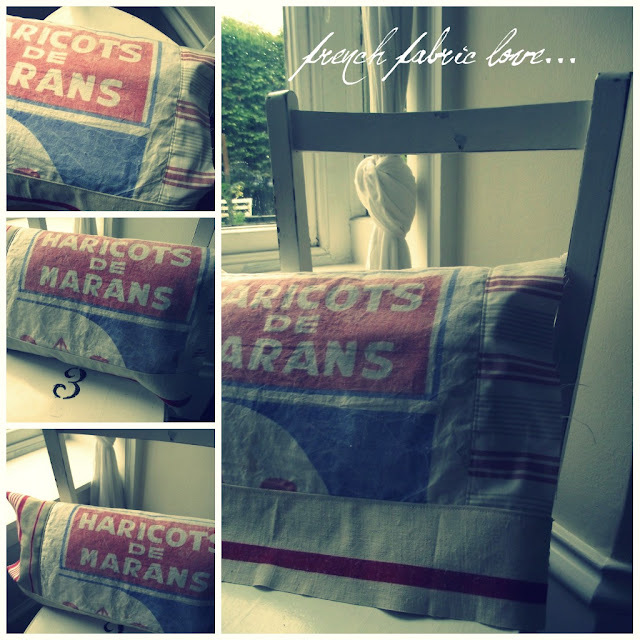 the french fabric is great too. so beautiful!!! i love the whole scene you painted in this post. sounds so inspiring. i see those kinds of vintage grain or coffee sacks now and then and they are always sooooo expensive in SoCal. your pillow turned out so lovely. I love it. I love the bag of course but the little, "I love mum" is delightful. I wonder about the cheeky little soul who dared to pen that! I am sure they will go far in this world. Lucky Sarah. I hope you will list these in your shop as they would sell like hotcakes. PS hold out on those boots. 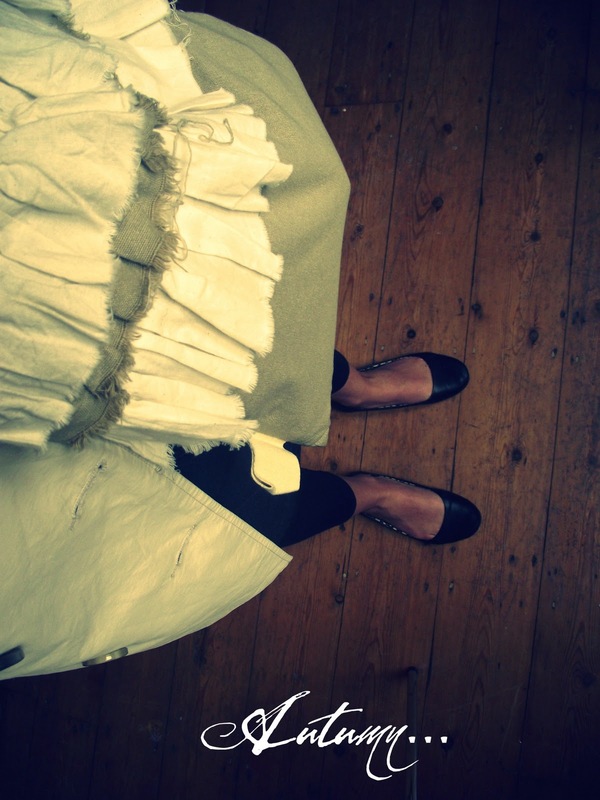 Today I ventured to ballet flats from boots.Almost the exact opposite. Sarah is so lucky!! If you ever decide to sell these I request to be first on the list please!!! :) Love those linen ruffles and that striped ribbon. PS About halfway through Dirt Music (thanks again for your recommendation).. read Cloud Street & The Riders years ago ..scratching my head as to why it's taken so long to read this. Really enjoying it so far and the essence of WA.. Winton writes amazing well from the female perspective too. Oh, I love the ruffly bag!!! You're right. The texture and the ruffles really shine against the muted backdrop. You are so talented. I think to have the time and space to sew and create like this is just the ticket - especially when it is raining, and you don't have to feel guilty about neglecting any so-called chores! I'd probably forget the school pick up! Mind you, right now, I'm just longing for the day when we'll have our house to ourselves again, without a tradesman or builder in sight. Can't wait to see what other rainy-day ruffly inspirations you will come up with! Sarah's bag looks just great. She'll be so thrilled with it. A lot of times it's difficult to get that "perfect balance" between usability and visual appearance. I must say you have done a amazing job with this. Additionally, the blog loads extremely fast for me on Opera. Exceptional Blog! your posts more, "pop"! Your content is excellent but with pics and video clips, this site could definitely be one of the greatest in its niche. exchange techniques with others, why not shoot me an email if interested. eyes which makes it much more enjoyable for me to come here and visit more often. connect with it better. Youve got an awful lot of text for only having one or 2 pictures. to your site since both of our websites are based mostly around the same topic. Would you prefer I link to you using your website address: http://www. Miss Sew & So. Please let me know at your earliest convenience. to weblog owners. It truly is a win win situation! sanford-macleod@bigstring.com so we may communicate further.